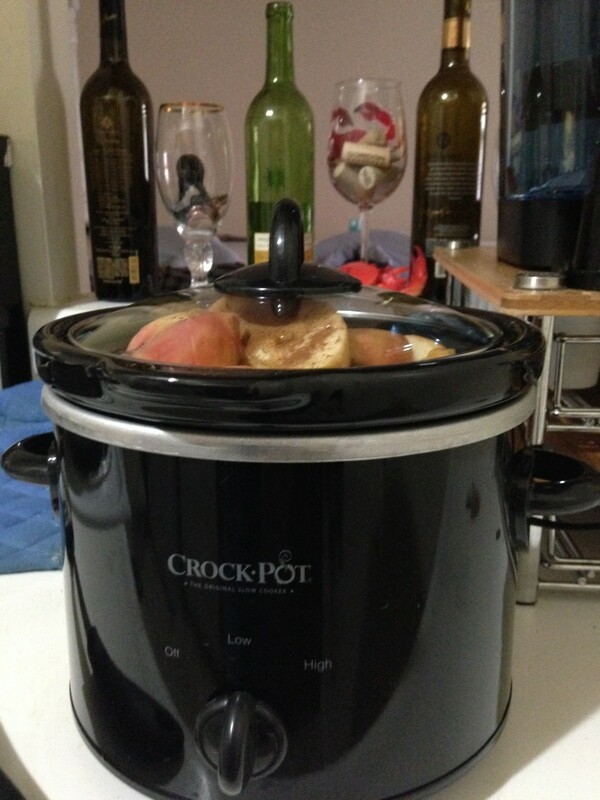 As my crock pot is only 1qt you may find that the ingredients aren't enough for your needs. I would have been able to feed three people easily. My coworker and I had two helpings (it had been a long day at work!) and I still had enough for lunch the next day. I am fairly confident that if you just used a larger pork loin you would just need more of all the ingredients. I bought my first crock pot last month. I felt like such an adult. I had no idea what I was going to use it for, but I knew that I needed one. My previous experience with slow cookers consisted of my mom telling me to turn it on after she left for work. 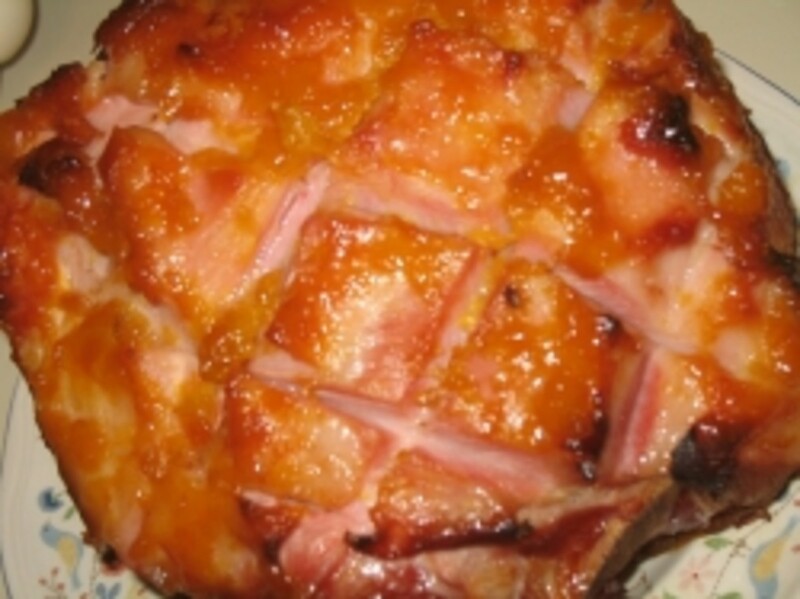 I came across a recipe for honey apple pork loin. But, it just showed the steps in pictures and listed the ingredients. Not exactly the most helpful thing in the world. But, it sounded good. I had a bunch of apples. 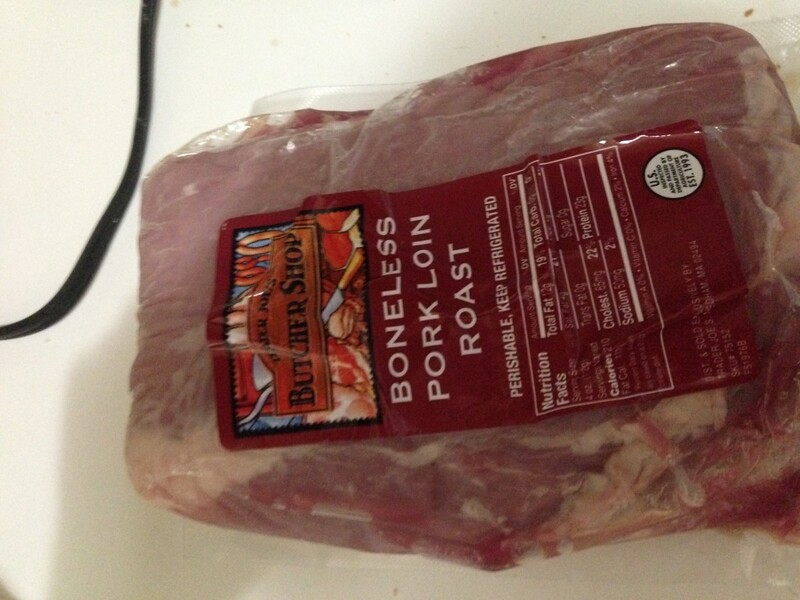 AND I found a pork loin that would fit in my tiny crock pot at the store. So, I decided that I would give this a shot. I encouraged one of my coworkers to come over for dinner, as I'm just one person and there was no way I would be able to eat all that pork even with leftovers. I was so nervous, since I had no idea how it was going to turn out. It was amazing! We both ended up getting seconds. Maybe it was because it was paired with a lovely wine. Or maybe it was the smell of cinnamon apples that greater us when we walked in. Either way it was a hit. I will most definitely be doing this one again. The pork was moist and flavorful and the apples reminded me of spiced cider. I was worried that the honey would make everything too sweet, but it wasn't. The honey was what helped everything become so tender. The pork just fell apart when I went to serve. The apples were even enough that I didn't want dessert! Since we were hungry we made mashed potatoes really quick to go with dinner. Over all it was like a little bite of fall in the middle of summer. I'm looking forward to coming home to this meal again when the weather changes. Gather all of your ingredients. Make sure you was the apples before use. Have the crock pot out and ready for use. Slice the apples into various sizes. I first cut them in half and then I quarter those halves. I also just cut one apple into quarters. Using a sharp knife cut the pork loin in four places. Try to make the cuts only as deep as half the pork loin and make them equidistant from each other. Pour a little honey in each of the slices, sprinkle with cinnamon, and then place an apple slice or two in the cut. 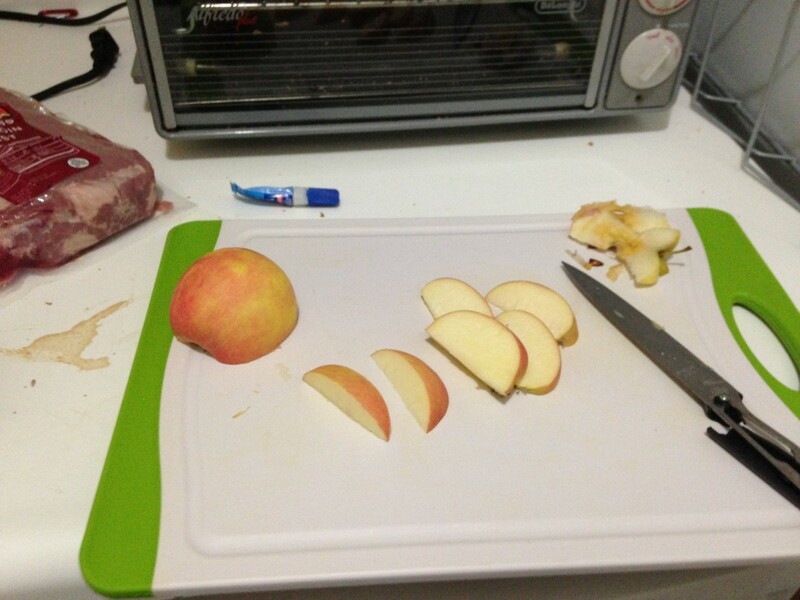 try to make sure the apple slice is able to go all the way down to the bottom of the cut. 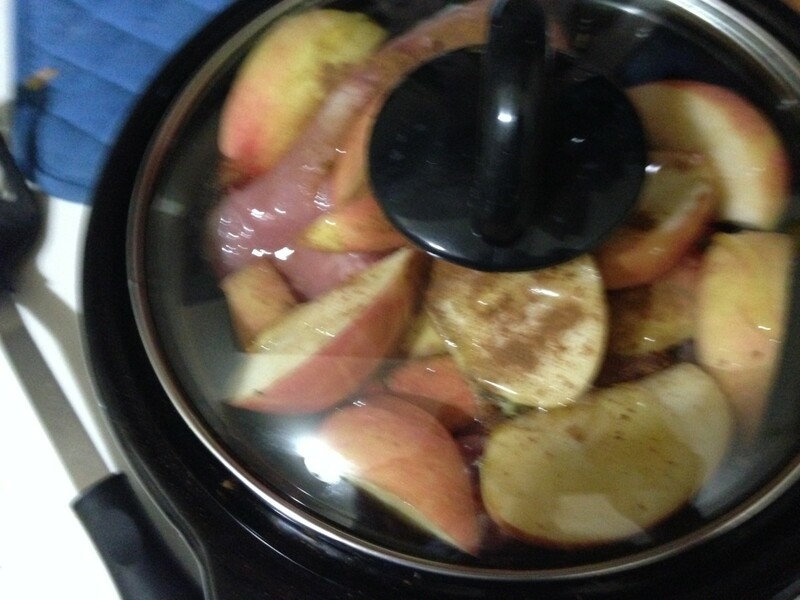 Line the bottom of the crock pot with apple slices. Pour a little honey and sprinkle some cinnamon over the apple slices. 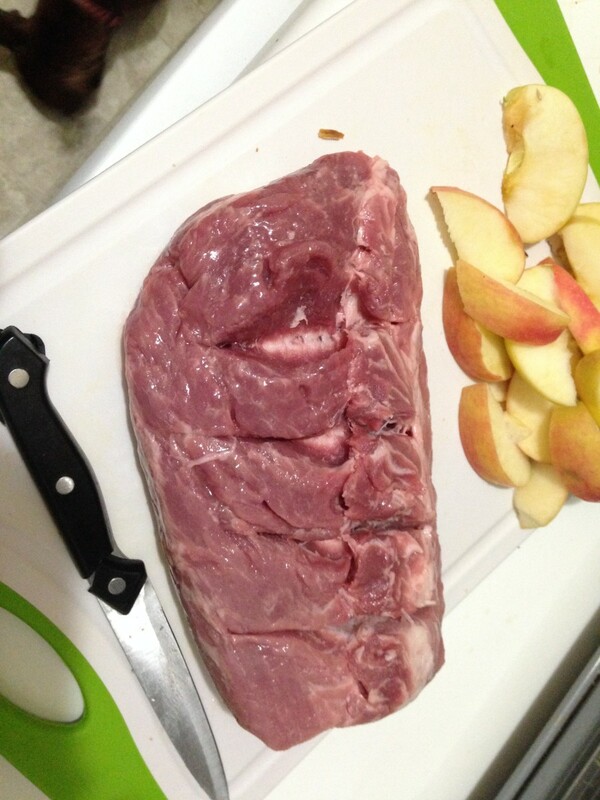 Place the pork loin over the apple slices in the crock pot. 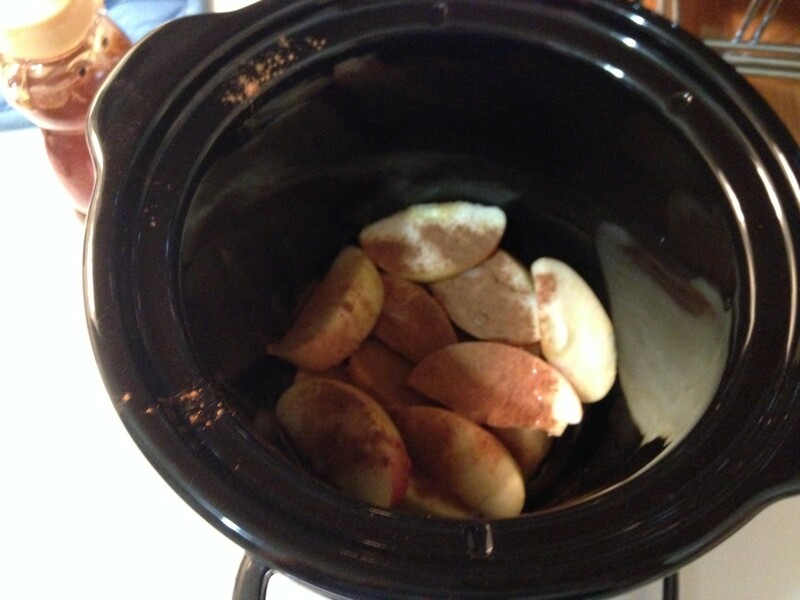 Use the rest of the apple slices to fill in the crock pot. Placing them on top and all around the pork loin. 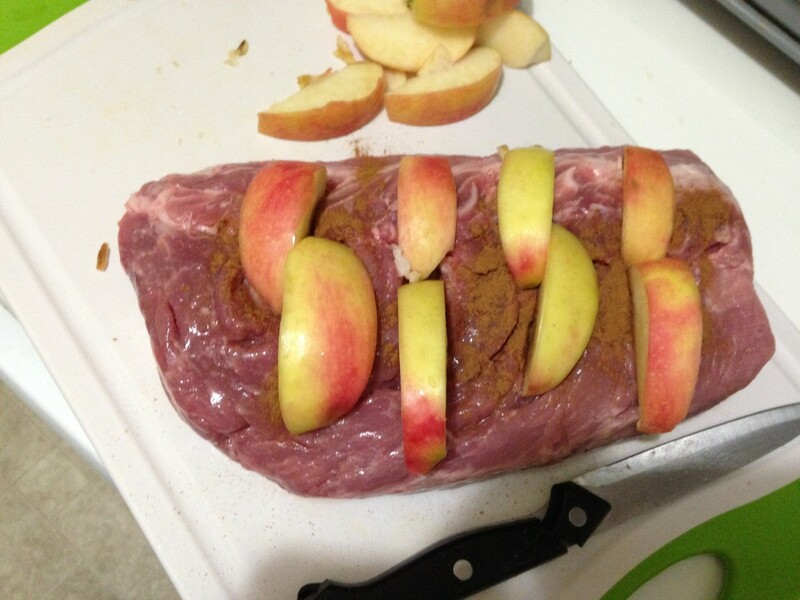 Sprinkle cinnamon and pour honey over the top of the pork loin and apples. Put the lid on the crock pot. Cook on low for 8 hours or on high for 4 hours. Enjoy! 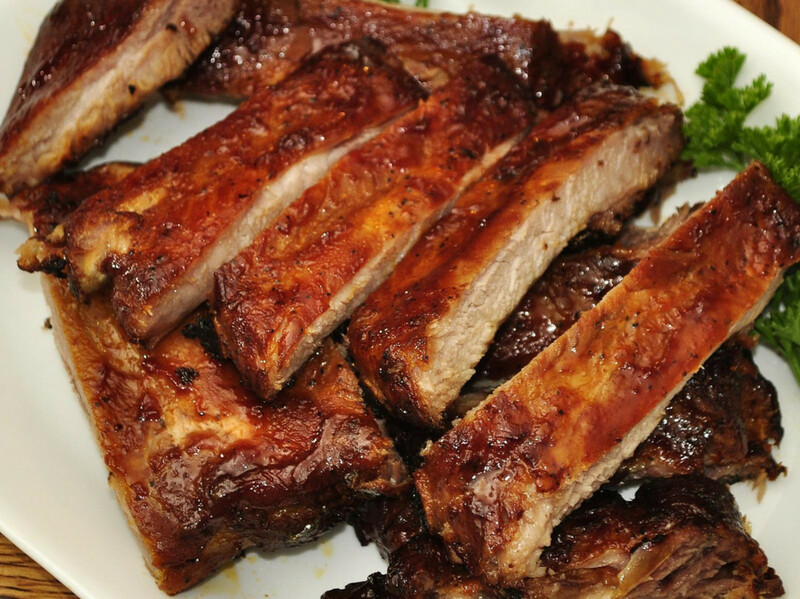 The original recipe showed apple cider vinegar. But, since they didn't have any instructions I have no idea when it would be used. So, I didn't use it. I also didn't have any. 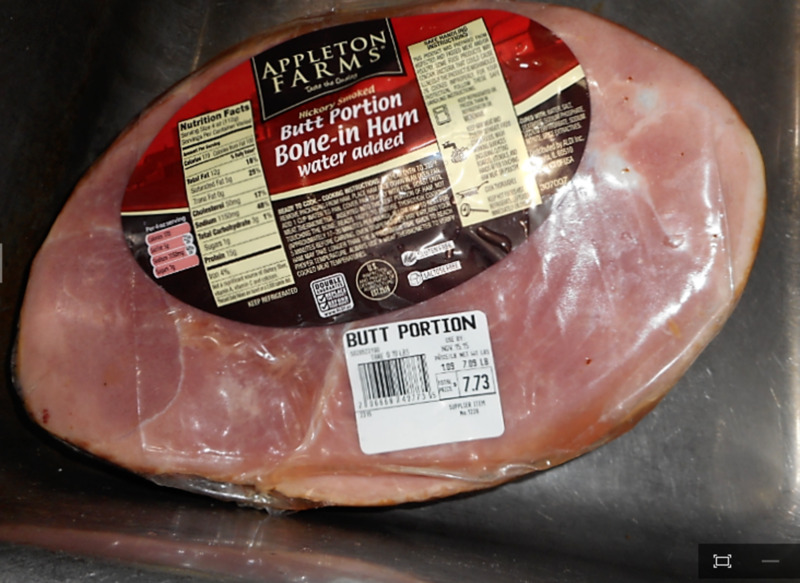 However, I'm sure if you placed it on the bottom it would give more flavor. As far as that goes it might be nice to add a little Jack Daniels Tennessee Honey. You know, for a little kick. If your family isn't afraid of raisins I think they might add a nice flavor to the dish. I think golden raisins would be best. Or maybe even crasins. I've wondered how a pear would be in this dish as well as far as that goes. I would even consider added pomegranate to give it a little different flavor and texture. Scott, I'm glad you liked it. I think I'm going to try it with golden raisins next time. One of my coworkers suggested figs, but i'm not too familiar with that flavor so I don't know how that would be. Tony, The apples were what convinced me to try it. I'm not sure how it would be, but I wonder if chicken or tofu could be substituted for pork. Or maybe even turkey. Now I'm just excited for fall to try all these ideas! 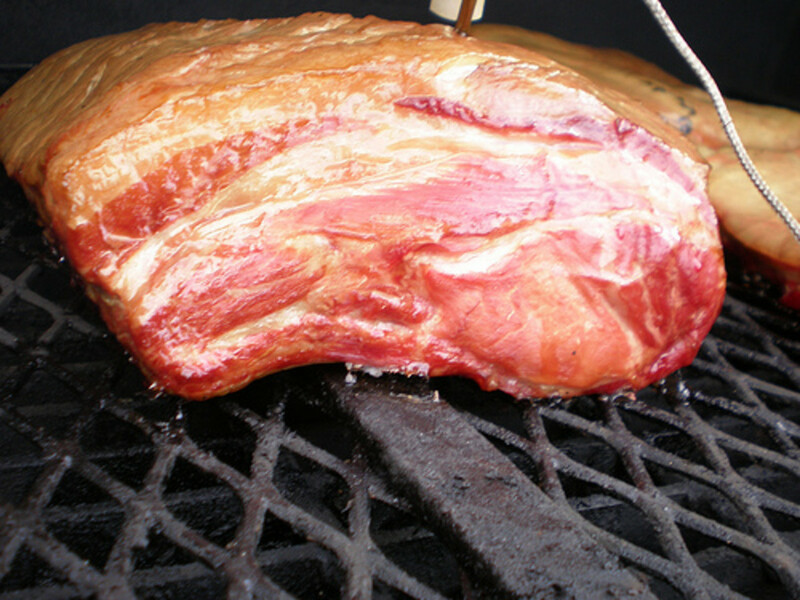 The pork Loin looks delicious and interesting unfortunately I am not a fan of pork but I love apples. Looks yummy! It sounds like you cook like I do - no sooner that I make a dish I'm thinking of other add-ins for the next time I make it! Pinned.